In September, 2011, a delegation of the Russian Orthodox Church Outside of Russia brought the Kursk-Root Icon of the Mother of God “of the Sign” to Kazakhstan. During the icon’s stay in Almaty, Archbishop Mark, who headed the delegation, granted an interview to the magazine Light of Orthodoxy in Kazakhstan. — Vladyka, tell us please about the life of the Russian Orthodox Church in Germany. Who comprise the majority of your parishioners, Russian emigres or native Germans? What language is used during divine services? — Until 1990, our parishioners were mostly emigres of the first and second waves, that is, those who fled Russia after 1917 and after World War II. Many of them gradually moved to America and Australia, so our parishes began to decline by 1990. When the borders opened, Germans from the Soviet Union were allowed to relocate to Germany, so there was an infusion of new blood, mostly from Kazakhstan. Before 1990, the language of our divine services was half Church Slavonic and half German, but by the early 1990’s we started serving mostly in Church Slavonic. But now we again have a tendency towards using German, because the children of the immigrants don’t have the same motivation to preserve the Russian language and culture as the old emigres did, and for this reason we serve partly in German. It is usually like this: a priest serves in Slavonic, while the Gospel, Epistle and one or two litanies are read in German. In some parishes it’s the opposite, once a month they serve in German, but the Epistle and some litanies are read in Slavonic. As far as Germans who have converted to Orthodoxy are concerned, they are few, but a small percentage exists in every parish. There are also people among our parishioners who come to Germany temporarily, for work or school: college students, professors and scholars. — Do you have converts to Orthodoxy from Catholicism or Protestantism? — There are such people, but they represent a very small percentage. Our priests are working in this direction. We have a yearly seminar for people who are interested in Orthodoxy, and we acquaint them with our lives and some of them accept Holy Baptism. — You minister to parishes of the Russian Orthodox Church Outside of Russia not only in Germany, but in Great Britain, too. Is the church situation there different? — Yes, it is different. As I said, in Germany, there is a large percentage of parishioners who are from Kazakhstan, so-called Russian Germans. You don’t find these people in Great Britain. There, the parishes of the Russian Orthodox Church have a small number of Greek Russians, but not many at all. Mostly these are people who moved to the country for various reasons, mostly for work, some of them moved there permanently, others only for a time. — You were born and reared in a Protestant family. How is it that you, a German by blood, became a bishop of the Russian Orthodox Church? — When I was a young man, I studied in the philological department, Slavistics and Old Russian, Ancient Russian literature, Church Slavonic. That is how I became acquainted with the spiritual literature of Old Rus. A greater impression was made on me by the works of St Nilus of Sora. When I read them, I understood that I must become a monk, choose the path of service to the Church. I grasped that the Truth was in Orthodox Christianity. That is why there was no question that I must leave Protestantism. But I did not immediately become a monk, I prepared for many years: I would travel to Mt Athos, and learned a great deal from the old Russian startsy there. Since we needed priests in Germany, I was ordained to the priesthood. I did not dream of becoming a hierarch, but that was what the Church decided. — You actively participated in the process of reunification of the Russian Church Abroad with the Moscow Patriarchate. What changed in your life after this finally took place? — It is very significant that we now have the opportunity to have such close contact, to pray together, to serve together. This is the most important thing. We now participate in all the events of Russia, we participate in the Councils of Bishops. I think this is of great importance. — We know that after the reunification of the Churches, some members of ROCOR did not recognize the unification and preferred an independent path in church life, for instance, Lesna Convent in France. What can be said now about this group? — Sadly, these people are so blinded, so fanatical, that they are incapable of recognizing the actual situation in Russia, in the Russian Church, and so they have torn themselves away from the Church. This causes us great pain, because among them are parishes, monasteries that were dear to us. They broke off, without seeking counsel, some even giving no hint that they were disturbed by the process of reunification, simply declaring suddenly that they are no longer with us. A schism such as this in any organism is painful, and, of course, many of us suffer greatly from what happened. On the other hand, in numbers, this is a very small percentage and does not represent the real face of our Church. — Is this your first visit to Kazakhstan? — What are your impressions? 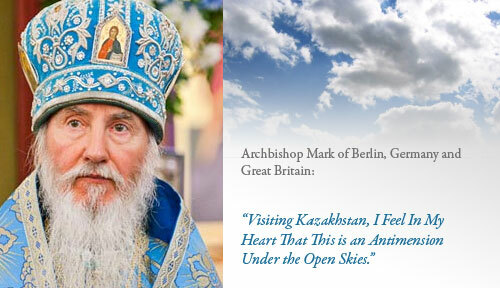 — I had read a great deal about Kazakhstan and also heard much from my parishioners. But one gets a more profound impression in person. I must say that I was very happy to have the possibility to come to know the believers of your country. In Astana and Almaty, we met civil representatives and I understood that the attitude towards the Church and the faithful is positive here. This is very important for us. I think that many of those who left this country in the 1990’s did so to escape what they feared would be heightened tension with the government. At the same time, as I see it now, this relationship is very positive. I think that the Orthodox people here have a future and must hold fast to their faith, their rules, their way of life. Visiting the expanses of Kazakhstan, I feel in my heart that this is truly an antimension under the open skies. Every populated place here is connected with the name of a New Martyr or Confessor, every kilometer of Kazakhstan soil was bathed with the blood of those suffering for Christ. Karaganda occupies a special place on the spiritual map of the country, having preserved until this day a living memory of the death camps—Karlag, Steplag, Peschanlag, and other horrible places of torture and executions of innocent people. A great holy man of God shone in Karaganda, Elder Sevastian, in whose podvig we see witness for Christ as was the continuation of the prayerful podvigi of the holy Elders of Optina. — You often accompany the Kursk-Root Icon of the Mother of God on its pilgrimages to various countries. What does this holy icon mean to you? — Even as a layman, I frequently had the opportunity to pray before this icon. Later, as it turned out, the first month of my priesthood I was appointed to travel together with another priest and this icon to several of our parishes. I saw how the people were drawn to this holy image and witnessed miracles happening in its presence. So not only I but many of our clergymen became very attached to this miracle-working icon. — Could you share one of the miracles you witnessed? — At one parish I had attended for many years as a layman, I accompanied the icon not only to church but to the homes of sick people. We took the icon to one very old woman whom I knew well; she had been unable to walk for several years. She asked that we warn her in advance of our arrival so that she could have her son come and open the apartment. But when we arrived, she opened the door herself and after that, she would walk to church by herself, and for several years. This was the first genuine miracle that I witnessed. But later I was witness to very many miraculous events. — Allow us to thank you on behalf of our readers for heading the delegation of the Russian Orthodox Church Outside of Russia which allowed us to venerate this great holy icon of the Orthodox Church. — We are very thankful to His Holiness Patriarch Kirill of Moscow and All Russia and the First Hierarch of the Russian Orthodox Church Outside of Russia, His Eminence Metropolitan Hilarion of Eastern America and New York, who blessed the visit of the Hodigitria of the Russian diaspora to your country. I would like to thank His Eminence Metropolitan Alexander of Astana and Kazakhstan, the head of this Metropolitan District, for organizing the visit of the Kursk-Root Icon of the Mother of God to Kazakhstan. It was his good initiative that the people of Astana, Karaganda and Almaty, over two hundred thousand of them, and over a short period of time, could venerate the holy icon. I also thank the archpastors of the dioceses of the Kazakhstan Metropoliate, Vladyka Metropolitan Seraphim of Borjomi and Bakurian, and the clergymen and faithful for sharing this joy of common prayer. — May the Lord save you, Vladyka, thank you for this interview. I hope that we will once again see you on Kazakhstan’s soil.